There was shock news in town with a big cloud hanging over the future of the Sparrow Hawk Hotel in Church Street when the owners Peakwing Properties went into liquidation. Such was the historic value of the building, built in the oldest part of the town, that the sale notice went in The Times. Administrative receiver Mr Ian Powell said he imagined a buyer would come from the trade, perhaps one of the big chains. He confirmed staff would be kept on in the immediate future with a big push needed for Christmas trade. The town was put on alert, particularly for old folk, with conmen trying to get their money. There were some shocking examples including a lady of 72 who lived in Richmond Street. She went to the front door whilst a second man sneaked in the back and stole two purses with no less than £227 cash in them. Another man told an 82-year-old lady he'd backed into her wall with his car and done £5 worth of damage. He handed her £10 and asked for change and when she got her purse he snatched it with over £600 inside. Elsewhere, two men were working in tandem, getting into the houses of old people by claiming to be working for the water board. Police asked these old people to be extra vigilant, be careful who they opened the door to and under no circumstances allow anyone in their houses without being certain they were bonafide. One poor man and his wife in their mid-20s decided to go for a drink at the Flying Dutchman in Padiham but the man certainly got more than he bargained for. As they left the pub and stood outside he saw a youth come over and urinate down his leg. Now, naturally, he quite reasonably took umbrage, but he probably was not best advised to push the youth. That landed him in court with the magistrate warning him that next time he'd find himself in very serious trouble for taking the law into his own hands. Next time? Was this a regular occurrence at the Flying Dutchman? Did they not provide toilet facilities? Maybe people needed to stop drinking because health chiefs were worried after a shock report revealed Burnley had one of the worst alcohol records in the North. Amidst warnings that the figures were merely the tip of the iceberg, and coupled with the rocketing drugs worry, it was decided by those health chiefs to resolve it by setting up a special alcohol council ling service at a cost of £150,000. Ahead of Burnley's second cup tie in days against Doncaster Rovers there was news of a footballer from Padiham who had been transferred for a few way in excess of anything that Burnley had ever paid for a player. That player was Andy Payton who was sold by Hull City to Middlesbrough for a fee of £750,000. 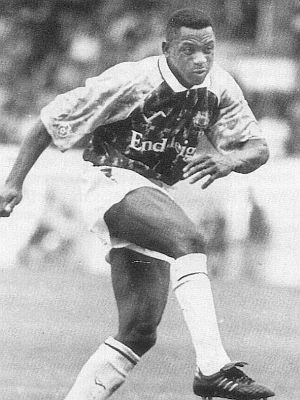 Payton had been with Hull through their YTS scheme and, as a professional, had become a prolific goalscorer. There had been speculation of a move to Scotland with Celtic, but Payton opted for this move with 'Boro boss Lennie Lawrence reporting that they would make him a better player. Andy's mum said: "Naturally we are thrilled at the move, but we often think what might have been had he signed professional forms for Burnley. He used to be Clarets mad." Jimmy Mullen made three changes for this Autoglass Trophy game. Andy Marriott, who was not given permission to play in the FA Cup tie, returned at the expense of Chris Pearce. Ian Measham was fit again and replaced Paul France whilst Roger Eli was recalled with Graham Lancashire taking one of the two substitute roles. 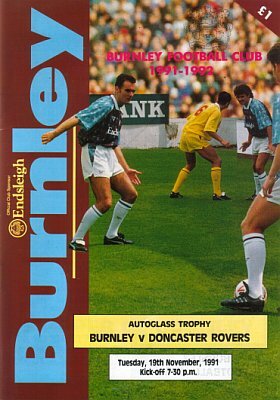 Failing to beat Doncaster in the FA Cup was a shock, especially for a side on that long run of wins, but there was never any doubt in this game as the Clarets beat the same opponents comfortably. Doncaster's main tactic was to play a blatant offside game, and it certainly worked in the first half hour as Burnley were caught time and again. Then came the first goal. Steve Davis, who had his best game yet in Burnley colours, won the ball almost on the half way line. He looked up but the two players ahead of him, hardly surprisingly, were offside. So Davis went on a run. He raced upfield but was pushed wide. That was no problem as the central defender delivered the inch perfect cross for John FRANCIS that he just couldn't miss and he didn't. Burnley were finally in front and nothing was ever going to change that. It was almost 2-0 just a few minutes later. Andy Farrell set up Roger Eli brilliantly but visiting goalkeeper Mark Samways made a breathtaking save to deny the recalled striker. Eli and Burnley weren't to be denied. Right on half time Farrell again got on the ball. This time he played it wide to Mike Conroy who in turn laid it off to Steve Harper, another player in outstanding form. Harper played the ball across to ELI on the edge of the box. He shaped to shoot with his right but confused the defence by switching it to his left and placing an inch perfect shot just inside the post for 2-0. Quite how we failed to add to the scoreline in the second half was a mystery, but the 2-0 win, coupled with the 3-1 win at Blackpool in the first game, saw us through to the knock out stages. The draw was kind too, giving his a home tie against Scarborough whilst the FA Cup draw had been equally kind with a home game against Rotherham should we beat Doncaster in the replay. The only disappointing news was Blackpool playing a league game and beating Wrexham 4-0 to go above us in the table, dropping us out of the automatic promotion places. We now had to prepare for three consecutive away games with league fixtures at Maidstone United and Northampton Town with that FA Cup replay between them. Burnley: Andy Marriott, Ian Measham, Joe Jakub, Steve Davis, John Pender, Andy Farrell, Steve Harper, John Deary, John Francis (Mark Yates 83), Mike Conroy (Graham Lancashire 83), Roger Eli. Doncaster Rovers: Mark Samways, Brian Rowe, Lee Boyle, Andy Crosby, Brendan Ormsby, Colin Douglas, David Harle, Eddie Gormley (Tommy Tynan 65), Mark Rankine, Roger McKenzie (Nicky Limber 45), Kevin Noteman.